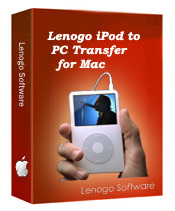 Lenogo iPod to PC Transfer for Mac is an ultimate application for transferring songs from an iPod to a Mac based PC. Lenogo iPod to PC Transfer for Mac pro is a sound of blessing for frustrated Apple's iTunes users who can't copy music files from iPod to pc desktop or laptop since iTunes blocks iPod-to-computer song transfer. Now the things are different! With Lenogo iPod to PC Transfer for Mac, iPod users can transfer iPod Songs to Mac. an ultimate application for transferring songs from an iPod to a Mac based PC. ...... Lenogo iPod to PC Transfer for Mac utilizes iPod's internal database to display your iPod's contents instantly. Lenogo iPod to PC Transfer for Mac is fully compatible with all existing iPod including iPod(1st, 2nd, 3rd, 4th, and 5th generation iPod), iPod Photo, iPod mini, iPod shuffle, iPod nano and iPod video. Lenogo iPod to PC Transfer for Mac Pro would be a wonderful thing to know we'll never have a hard drive failure, a system crash with data loss or our computer stolen, but that's not reality. Those things happen. Sooner or later plenty of iPhone users will need to the same as we've done with a computers--a fresh install of the operating system, either because of a physical defect which requires new hardware, or to eliminate any of the spyware, viruses, and other exploits. It can record TV shows and easily transfer the shows to iPod-compatible format. Transfer YouTube/Google Videos to Your iPod. Qweas is providing links to Lenogo iPod to PC Transfer for Mac Pro 4.6 as a courtesy, and makes no representations regarding Lenogo iPod to PC Transfer for Mac Pro or any other applications or any information related thereto. Any questions, complaints or claims regarding this application Lenogo iPod to PC Transfer for Mac Pro 4.6 must be directed to the appropriate software vendor. You may click the publisher link of Lenogo iPod to PC Transfer for Mac Pro on the top of this page to get more details about the vendor.